In the first year we spend a lot of money and only a small amount was earned. The business does not yet go so very well. Even the running cost of the bus is higher then it's earnings. Anyway, a New Year is a good moment to save the game. The value of the company is $42,000. 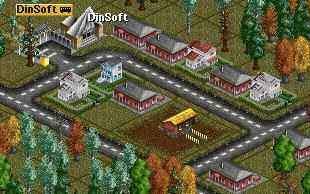 Dinsoft has now 69 inhabitants and Gadtown 167. The service level on both bus stations is 40%. This is not so good; we can try to improve this. 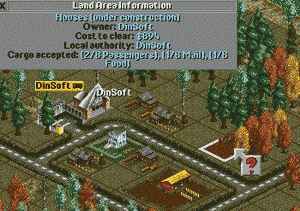 The best we can do is to start another bus service from Dinsoft to Lendhead. 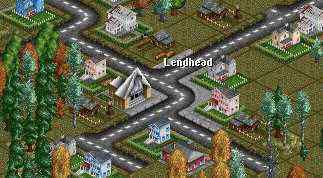 Lendhead is quite a large village and has about 233 inhabitants. A bus service from here will hopefully bring in some more money. OK here it goes. First we have to borrow $20,000 more to buy the bus and then we have to build a bus station and another garage. The first bus leaves Lendhead with only one passenger. It earns $28 in Dinsoft. When it comes back in Lendhead there are 25 passengers in the bus. To serve all these passengers we put the bus load settings to "full load", now the bus waits until it is full and then it leaves to Dinsoft. The bus capacity is 31 passengers. On June 3 bus is full and leaves for Dinsoft. It becomes now busy at the Dinsoft bus station, there are already two busses. The bus from Lendhead bus earns $856. On July 1 we got a message that a new printing works is opened at Brubourne. A printing works supplies crates with goods, but it needs paper. The paper has to come from a paper factory. The paper factory needs wood. Wood has to come for a forest. Well there is no forest, neither a paper factory, so we can do nothing but wait. It's also time to mention that at the end of 1950 a competitor founded a new company. They had a look around and found no place to start a transport service, so they are not yet active. The company name shows "Unnamed", but they are losing money due to the regular payments of the interest on the loan. In the Operating Profit Graph, the yellow line, which shows the profit from the WWW Transport company, tends to go upward into the direction of the black figures. Now we have a quick look to Dinsoft. As can been seen there are some new houses under construction. Why are there no trains yet?? Well the transport businesses it not yet so good that we can afford to operate trains. At the end of this year we will have a look on the map to see if there are already some villages which are of our interest to start a train service. Now we have two busses, Bus 1, Dinsoft to Gadtown still loses money, Bus 2 from Lendhead to Dinsoft makes money, it stands on $1,370. not so bad. It seems that Bus 1 has a problem, the reliability is only 13%. This is very low. The bus needs to go to the garage for a service. We have to send it manual to the garage. When a bus is close to the garage, then click on the garage button. If a vehicle is far away from it's own garage it tends to search for another garage. After it went there, it is sometimes difficult to find the original road back. After the service, when a vehicles leaves the garage the reliability is back to the original value of 93%. The New Year 1952 arrived, see the financial overview. We have only a loan of $60000, it is time to look if a new service can be started. We would like to start a train service, but the locomotives are still very expensive. Time for a new service, lets start a bus service from Slindwood (135) to Kendhattan (209). We have to borrow some more money to buy the bus. Bus 2 and 3 are doing well, but we are worrying a bit about bus 1, however, this is a new service, so it may improve in the furure. A New Year arrives. The earning graph goes once more in the wrong direction. In fact Bus 1 still loses money. We try to change the load setting of this bus to a "full load" at Gadtown. It is the first of March, Bus 1 is still doing bad. we close this line and make a new one, with the same bus, between Lendhead and Slindwood. Lendhead has continuously passengers waiting. The bus arrived at it's new service and picked up 31 passengers from Lendhead. Just received a message about a new farm near Wrunthill City. In October our money goes into the red figures, we have to borrow another $20,000 to keep them black. If we don't do this the company will go bankrupt within a few months. Why do we not start a train service?. Well, it's simple, the only one train we can buy is very expensive. The running cost is $6,616 per year and we need to pay $57,260 to buy it... In a short time there will come a cheaper train. That one we go to use. Trains are better than busses, because busses can be destroyed by UFO's, they take sometimes a wrong road and the capacity is only 31 passengers. As soon as we have more the 50 passenger a train service can be started and brings up more money. Ai, we forgot to boorow some more money, now there was a message that WWW Transport goes bankrupt if performance not increases. The bus earnings are increased the last year, no more losing money. All busses are positive. However, the total earning is still negative ($4,484) But it's not to bad. Once more, this is a good moment to save the game. The village Dinsoft is still growing. You can see many new houses. The number of inhabitants is now 157. 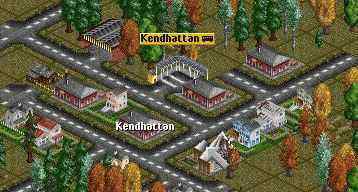 Kendhattan has over 300 inhabitants, we set the bus there to "full load" to increase the service and to try to make some more money. Here the situation at Lendinghead, were two busses are approaching the bus station with 36 waiting passengers. The bus on the right comes from Dinsoft and is empty, the other bus comes from Slindingwood and carries 5 passengers. The life time of busses is about ten years. If we invest all our money in busses, then we have to buy all new busses after these ten years. That is always a big problem. Very soon we have to start with some railway services, it's very good to prepare already some railway stations. Hurry up start with it. A good choice is a passenger and mail train service from Lendhead to Kendhattan. 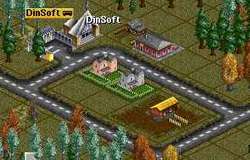 However these new companies are established by the built-in intelligence of the game and that AI is not so very clever. However, they can cause a lot of problems by blocking roads, building of railway station on your place etc. In Lendhead, where the WWW Transport railway station was planned to come is now an airport of the competition. We have to look for another place. OK we go to build a railway between Lendhead and Kendhattan. Bus 1, which crosses this railway will be sold. This gives some money to buy the new train. If we keep the bus going here, then sooner or later it will collide with the train. The operating profit graph goes still up and down, at some places it goes just over the zero line. Our loan is now $180,000, there is only a money reserve of $20,000. The two busses left are set to full load at Dinsoft and at Slindwood. So they don't take away the passengers from the train. The development of Lendhead goes very well. We got the message that it accepts goods. This is only at the larger villages. However, we have no goods to transport. Also we receive a special offer for a new just developed train. It is a small diesel with a low price and a low operating cost. The speed is low, but it can replace some busses. With two passenger cars and a mail van they can make a lot of money, special on not too long distances. On the right you can see our first train. It is the small one from the special offer we had just before. It has one passengers car and a Mail Van. The train is almost a kind of prototype. The reliability is low. To keep it in a good condition, the best is to force is for service each time it passes the depot. Another New Year arrived. We have now two busses and one train. 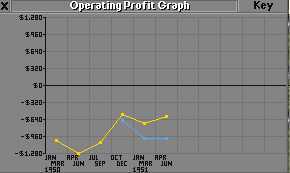 The Operational Profit Graph goes slowly up. The two busses which were set for "Full Load" are reset to standard operation. This will increase the performance of the train. Let's watch the train sometime to see if it can make money. The three competitors have all one aircraft. They all lose money, it's not so easy in this game. On July 2 we received a messages that the competitor Lendhead Transport is in financial problems. Another piece of information is given by the "Company League Table". As can been seen, the "WWW transport" is at the top. Lendhead Transport is now for sale. Its business is to bad to survive, however you need a lot of money to buy this company. For "WWW transport" is it impossible. At the first of October, the small diesel train, which we had already via a special offer is now available for all companies. The first competitor, Lendhead Transport went bankrupt. The others will follow soon, maybe our "WWW Transport" too. If we look to our financial situation then it can be seen that there are four negative posts. The train and road vehicle running cost are normal, we can't do a lot to decrease these. On the right you can see the demolished bus station. The station name is still visible in grey, but will disappear soon. The bankrupt company Lendhead Transport demolished it's airports and head quarter. The dark ground shows the former location of the airport. At the Lendhead Airport were 156 passengers waiting. They can now go to our railway station. On March 6 another new company was launched: "Tatfield Transport". Tatfield is quite a large city with already more the 700 inhabitants. It's very lucrative to start there a bus transport. Now with Bigwig & CO. Don't worry, it doesn't harm WWW transport. It is only good for our business. Due to the increasing number of passengers in Lendhead we had to add a second passengers car to the train. October 1, Bigwig & CO went bankrupt and all it's assets were sold off. This will bring again more passengers to our railway stations. 1958 arrived, no special news. The financial situation is not too bad. No great earnings, but only small losses. 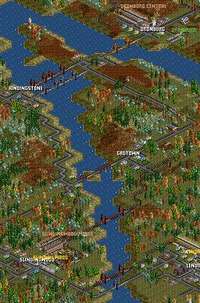 It looks like it will be possible to survive a few years more to wait till the villages are grown and a good transport service can be setup. In Drontburg is a new bank under construction. A bank needs gold. This can be transported from a gold mine. Very close to Drontburg is such a gold mine, so immediately a new transport company is founded. This new company starts to build a railway between the new bank and the gold mine. This is done by the AI of the game. You can see that this AI is not so very intelligent. The rails on the right has to be connected with the station. With a little planning the station would have been built with another orientation. WWW Transport Company has not enough money to setup a new service there. The cost of an Armored truck is already $24,704. In addition two truck stations and a road has to be constructed. This is just too expensive. At the end of June, the Drontburg Transport Company gave it up to construct the gold transport service. All railway station and rails are removed. The year 1958 is the first year where we really earned some money. Not a lot, but the total is positive $1,982. We still wait for a opportunity to make some real money. The rest of the year we watch the game. One of the competitors, "Gadtown Transport" wants to start a Goldservice from the Goldmine in Slindingwood to the bank in Dronburg. The bank is at the upper right and the Goldmine at the bottom left. As can been seen, several rivers has to be crossed and the terrain is also a bit hilly. After a few months they give up and leave for us a nice flat area to construct later our railroads. At the end of the first ten years the WWW transport Company status. The value of the company becomes each year a bit lower, we did not do any new investments in new services, only tried to keep the existing ones running without losing money. That is now OK, but in a few years our busses must be replaced. Due too the inflation they cost now a lot more then ten years ago. We have really to start with making money.